It was a cold, chilly Tuesday night, and I had just finished my first Microeconomics midterm. I made haste, walking quickly toward the C.C. Little bus stop to find the four wheels that would take me back to north campus. I clutched my phone and realized the United States Men’s National Team would soon play for their chance to qualify for the World Cup. Frantically, I unlocked my phone, my hands frozen to the touch, and it seemingly took eons before the ESPN app appeared on my screen. The USMNT needed either a win or a draw to qualify, facing a Trinidad & Tobago team that had not won in their past nine attempts. I scrolled down until my eyes saw the result I dreaded the most. I looked for something I could throw, but thought better of it, choosing to retreat to the bathroom and yell instead. I slammed my chapstick to the ground. The USMNT had lost to Trinidad & Tobago, and for the first time since 1986, the USMNT would not be going to the world cup. It feels as if those at the top believe the US will always qualify for the World Cup doing things their own way, regardless of how the rest of the world chooses to train recruits for their top-tier team. This disastrous loss for the USMNT upsets me for a variety of reasons. Poor decision making plagues American soccer, from the huge influx of money and resources into MLS and US Soccer for “development” to the continued use of “pay-to-play” systems rather than the more grassroots systems around the world. However, what shocks me the most is not the fact that the USMNT did not qualify, but rather the continued arrogance that has perpetuated US Soccer for decades. Many times Colin Cowherd and other members of the press would discuss how this USA team was ready to compete on the world stage and how they had as good a chance as anyone at beating powerhouse programs like Argentina. For a long time, Sunil Gulati and other US Soccer Federation Presidents have ignored how numerous leagues around the world recruit players, and have chosen instead to focus on creating more MLS teams rather than attempting to develop player academies that are used around the world. Club teams in Europe and South America have used academies to attain and sustain success for decades, yet the US seems ignorant. Instead, the US has chosen to stick to a pay-to-play system, where those who want to play need to pay fees in order to get started and really contribute. It feels as if those at the top believe the US will always qualify for the World Cup doing things their own way, regardless of how the rest of the world chooses to train recruits for their top-tier team. In 2014, the USMNT nearly reached the quarterfinals of the World Cup, almost beating Portugal in the group stages and Belgium in the round of sixteen — two of the best teams in the world. Everyone had reasons to be optimistic, as the USMNT had held their own against two elite clubs. It was easy then, to conclude that US Soccer was finally ready to take the next step and begin competing with the best the world had to offer. However that optimism would dissipate, starting with a loss to Jamaica in the Gold Cup finals in 2015, an unknown team ranked 94th in the world at the time. This was followed by an embarrassing 4-0 loss to Costa Rica in 2016, resulting in the firing of old USA manager Jurgen Klinsmann and the hiring of former US manager Bruce Arena. At first, the USMNT went back to winning, and after finishing First Place in the Gold Cup things appeared as though they would return to normal. 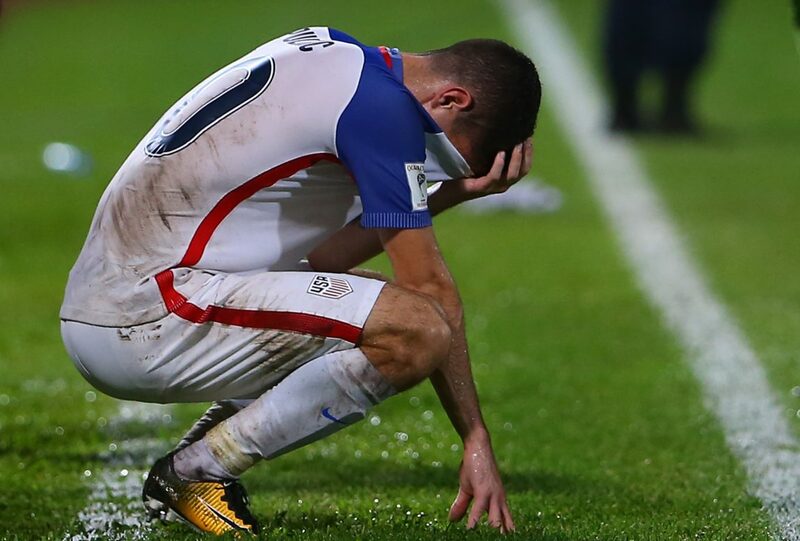 Then shock came once more as the USMNT lost once again to Costa Rica and managed a draw against Honduras in World Cup Qualifiers. Then, of course, came the heartbreak against Trinidad. Perhaps not qualifying might be important to bring a team back to its best or revitalize a team that underperformed. In 2000, Germany failed to move past the group stages of the UEFA European Championship, one of the biggest soccer tournaments in the world and one that Germany had traditionally done very well in. This loss was a shocking disappointment in comparison to how well Germany had done previously in the tournament. The DFB or German Soccer Federation, as well as the first and second Bundesliga or German Soccer Leagues, came together with a fourteen-year plan to regroup and help bring back German Soccer to its best. They won a World Cup in 2014 on the back of an amazing goal from Mario Gotze. Belgium missed the 2006 and 2010 World Cups. They finished in the quarterfinals in 2014 and are now among the favorites to win the world cup in 2018. In spite of this, that does not mean as Americans we can just assume not making the World Cup once is enough to shift the tide. We need to figure out what we did wrong and learn from our mistakes in order to climb higher as a result. Not being able to watch the USA even compete in the World Cup will be heartbreaking. Bruce Arena resigned, and he should not be the only one to go. It will be a long and dreary road, which will result in lost jobs and new changes to an out-of-date soccer federation. Ultimately, the USMNT will be better in the future because of this. With failure comes change, oftentimes necessary in the process towards greatness, and while the US may never be Brazil or Germany when it comes to soccer, we can only hope that they will be able to finally turn the page after this devastating blow.